A friend if mine simply adores Tim Pratt and so he piqued my curiosity when I saw this short story collection in the bookstore. Little Gods isn't thick by any means at under 300 pages but it does include 14 short stories from the author. First off, I really, really love the book design. Second, the book has an introduction by Michaela Rossner and then an afterword at the end where Pratt talks about his stories. As for the stories themselves, the adjective that best describes them is elegance. Whether Pratt's stories are very, very short (and seem to end abruptly) or long, his writing style is beautiful in its simplicity--not elaborate and filled with overdone descriptions but rather the type that anyone can appreciate and I found myself immersed in the text more several times. Pratt also has a knack when it comes to endings for they tend to be open-ended yet gives us enough closure for them to be an actual story (and some would say, profoundness). 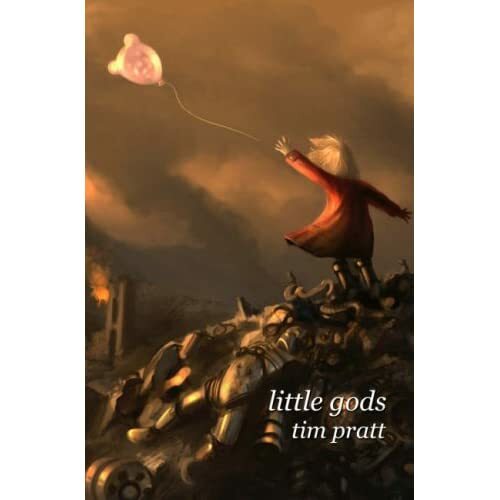 Little Gods is aptly titled because a lot of the stories in this collection deal with the mythical on some level--perhaps the short story equivalent of Neil Gaiman's Sandman series but Pratt narrates them in his own unique way. Pratt is also not afraid to venture into other genres, such as westerns in "Bleeding West" or superheroes in "Captain Fantasy and the Secret Masters". Here are my top three short stories in the collection: "The Witch's Bicycle" is this coming of age story of sorts that puts a new twist when it comes to the myth of romance. It's well developed and the various characters are given enough limelight to acknowledge their motivations. "Annabelle's Alphabet" follows an interesting concept as it's composed of twenty-six mini-narratives, one for each letter of the alphabet. Pacing is key here as a seemingly mundane tale evolves into something quite different. "Entropy's Paintbrush" is another well-crafted story that culminates in a satisfying ending. Little Gods is a great collection that I think almost anyone can enjoy. It's certainly a refreshing read that showcases the best of speculative fiction without being condescending to the reader.